Review: It’s been six months, and Callum Ormond is still racing for his life against evil forces he has yet to comprehend. Cal’s quest continues in June, the sixth book in the Conspiracy 365 series by Gabrielle Lord. Fifteen-year-old Cal begins this month escaping the deadly fires from his crashed plane. Amazingly, he comes out of this only a little worse for the wear. Thanks to his friend, Boges, he finds sanctuary and is able to spend a little time putting together some of the pieces of the puzzle shared by his late great uncle. Cal realizes that he must find the Ormond Jewel in order to solve the Ormond Riddle and hope to be able to discover the truth about the Ormond Singularity before it’s too late. He has six months left, but he also realizes he’s made little progress in the first six months. During the month of June Cal encounters old friends, some of whom turn out to be less than friends, old enemies who are even more determined, and ultimately the police. What must Cal do to make it to July and hopefully to his 16th birthday? He fears there’s a bigger goal out there than he realizes – his enemies want to eliminate him before his birthday. How will Cal be able to stop them? Once again, Gabrielle Lord has managed to pack non-stop action into her book. June maintains the excitement and energy of the previous five books in the series and has readers anxiously awaiting July. 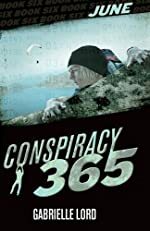 The Conspiracy 365 series is a phenomenal series for young adults. Although at times Cal’s ability to escape death by the narrowest of margins is somewhat unbelievable, it doesn’t matter. Her writing is exceptional, and it allows the reader to suspend reality for a little while and really believe that there could be a fifteen-year-old boy wrongly accused who could escape not only the police, but also the most evil crime lords, all the while traipsing throughout Australia, never being too short on food or money thanks to Boges. Cal’s exploits are fascinating – keeping pages turning well into the wee hours of the night. Plus Lord has done an excellent job with character development. Cal has changed a lot since January, but as readers will see in June, he has maintained a strong sense of duty and does not vary on his understanding of right and wrong. His friendship with Boges is unbreakable, but readers continue to be stumped about Winter. She seems to be helping him, but her mysterious nature and calamity that always seems to follow her keeps a question in the back of the reader’s mind – what does she really want from Cal? Characters like these and the never ending excitement will take Gabrielle Lord to the top of the charts for young adult writers. We would like to thank Kane Miller for providing a copy of June for this review. Have you read June? How would you rate it?